Louis Comfort Tiffany (February 18, 1848 – January 17, 1933) was an American artist and designer who worked in the decorative arts and is best known for his work in stained glass. Tiffany is the American artist most associated with the Art Nouveau and Aesthetic movements. Tiffany was affiliated with a prestigious collaborative of designers known as the Associated Artists which included Lockwood de Forest, Candace Wheeler, and Samuel Colman. Tiffany designed stained glass windows and lamps, glass mosaics, blown glass, ceramics, jewelry, enamels and metalwork. His surviving works memorialize his talents and his many pieces have inspired countless subsequent designers. Louis was the son of Charles Lewis Tiffany, founder of Tiffany and Company; and Harriet Olivia Avery Young. Louis married Mary Woodbridge Goddard (c. 1850-1884) on May 15, 1872, in Norwich, Connecticut and had the following children: Mary Woodbridge Tiffany (1873-1963) who married Graham Lusk; Charles Louis Tiffany I (1874-1874); Charles Louis Tiffany II (1878-1947); and Hilda Goddard Tiffany (1879-1908). After the death of his wife, he married Louise Wakeman Knox (1851-1904) on November 9, 1886. They had the following children: Louise Comfort Tiffany (1887-1974); Julia DeForest Tiffany (1887-1973) who married Gurdon S. Parker then married Francis Minot Weld; Annie Olivia Tiffany (1888-1892); and Dorothy Trimble Tiffany (1891-1979). He went to school at the Eagleswood Military Academy in Perth Amboy, New Jersey. His first artistic training was as a painter, studying under George Inness and Samuel Colman in New York City, and Léon Bailly in Paris. Louis Comfort Tiffany started out as a painter. He became interested in glassmaking from about 1875 and worked at several glasshouses in Brooklyn between then and 1878. 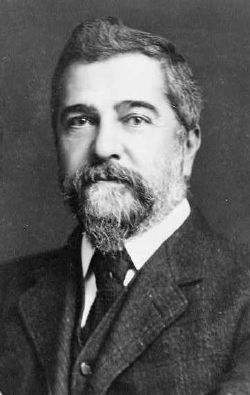 In 1879, he joined with Candace Wheeler, Samuel Colman and Lockwood de Forest to form Louis Comfort Tiffany and Associated American Artists. Tiffany's leadership and talent, as well as by his father's money and connections, led this business to thrive. A desire to concentrate on art in glass led to the breakup of the firm in 1885, when Tiffany chose to establish his own glassmaking firm later that same year. The first Tiffany Glass Company was incorporated on December 1, 1885, which in 1902 became known as the Tiffany Studios. The Holy City (1905) – St. John's vision on the isle of Patmos. Having 58 panels, this window is said to be one of the largest made by the Tiffany Studios. It is located at Brown Memorial Presbyterian Church (Baltimore, Maryland), which has eleven Tiffany windows. In the beginning of his career, Tiffany used cheap jelly jars and bottles because they had the mineral impurities that finer glass lacked. When he was unable to convince fine glassmakers to leave the impurities in, he began making his own glass. Tiffany used opalescent glass in a variety of colors and textures to create a unique style of stained glass. This can be contrasted with the method of painting in glass paint or enamels on colorless glass that had been the dominant method of creating stained glass for several hundred years in Europe. 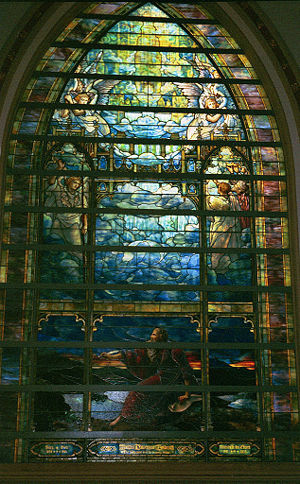 (The First Presbyterian Church building of 1905 in Pittsburgh, Pennsylvania is unique in that it uses Tiffany windows that partially make use of painted glass.) Use of the colored glass itself to create stained glass pictures was motivated by the ideals of the Arts and Crafts movement and its leader William Morris in England. Fellow artist and glassmaker John La Farge was one of Tiffany's chief competitors, along with Oliver Kimberly and Frank Duffner of The Duffner and Kimberly Company, in this new American style of stained glass. Tiffany, La Farge, and Kimberly had learned their craft at the same glasshouses in Brooklyn in the late-1870s. In 1893 Tiffany built a new factory, called the Stourbridge Glass Company, later called Tiffany Glass Furnaces, which was located in Corona, Queens, New York. In 1893, his company also introduced the term, Favrile in conjunction with his first production of blown glass at his new glass factory. Some early examples of his lamps were exhibited in the 1893 World's Fair in Chicago. He trademarked Favrile (from the old French word for handmade) on November 13, 1894. He later used this word to apply to all of his glass, enamel and pottery. Tiffany's first commercially produced lamps date from around 1895. Much of his company's production was in making stained glass windows and Tiffany lamps, but his company designed a complete range of interior decorations. At its peak, his factory employed more than 300 artisans. He used all his skills in the design of his own house, the 84-room Laurelton Hall, in Oyster Bay, Long Island, completed in 1905. Later this estate was donated to his foundation for art students along with 60 acres (243,000 m²) of land, sold in 1949, and was destroyed by a fire in 1957. The Charles Hosmer Morse Museum of American Art in Winter Park, Florida houses the world's most comprehensive collection of the works of Louis Comfort Tiffany, including Tiffany jewelry, pottery, paintings, art glass, leaded-glass windows, lamps, and the chapel interior he designed for the 1893 World's Columbian Exposition in Chicago. After the close of the exposition, a generous benefactor purchased the entire chapel for installation in the crypt of the Cathedral of Saint John the Divine, New York in New York City. As construction on the cathedral continued, the chapel fell into disuse, and in 1916, Tiffany removed the bulk of it to Laurelton Hall. After the 1957 fire, the chapel was rescued by Hugh McKean, a former art student in 1930 at Laurelton Hall, and his wife Jeannette Genius McKean, and now occupies an entire wing of the Morse Museum which they founded. Many glass panels from Laurelton Hall are also there; for many years some were on display in local restaurants and businesses in Central Florida. Some were replaced by full-scale color transparencies after the museum opened. A major exhibit at New York's Metropolitan Museum of Art on Laurelton Hall opened in November 2006. A new exhibit at the New-York Historical Society displayed through May 28, 2007, featured new information about the women who worked for Tiffany and their contribution to designs credited to Tiffany. Tiffany maintained close ties with the family firm. The Tiffany Company sold many products produced by the studios. He became Artistic Director of Tiffany & Co. after his father's death in 1902. The Tiffany Studios remained in business until 1932. He died on January 17, 1933, and was buried in Greenwood Cemetery in Brooklyn, New York. Tiffany is remembered for his contributions to the world of art and design. He was one of the first to experiment with fine glass that contained impurities and would convince others to work with such, as well. His pieces were initially novel because of his use of colored and textured glass rather than clear glass painted after being created. Tiffany was famous for his unique window and lamp designs, though he also fabricated many other pieces of home decor. He was a pioneer in the field of decorative glass and his work has continued to inspire those who have followed him. His legacy lives on in the pieces he created, many of which are displayed at various museums and galleries. Louis C. Tiffany Garden Museum Mae Station - The railway station of the longest name in Japan. ↑ "Mrs. Julia Tiffany Parker, daughter of Louis Comfort Tiffany of this city and Miami, Florida, was married to Francis Minot Weld of 720 Park Avenue yesterday afternoon at the home of the bride's sister, Mrs. Rodman Gilder, Oyster Bay, Long Island." New York Times, "Mrs. Parker Weds Francis M. Weld; Daughter of Louis Comfort Tiffany Married at Her Sister's Home in Oyster Bay, Long Island. Bridegroom, Bond Broker. He was a Captain of Artillery in World War. Bride Is Former Wife of Gurdon S. Parker," August 18, 1930. ↑ The Charles Hosmer Morse Museum of American Art, Hugh F. McKean, Hugh F. McKean Retrieved February 4, 2008. ↑ The Charles Hosmer Morse Museum of American Art, Jeannette Genius McKean, Jeannette Genius McKean Retrieved February 4, 2008. The Charles Hosmer Morse Museum of American Art. Hugh F. McKean. Hugh F. McKean Retrieved February 4, 2008. The Charles Hosmer Morse Museum of American Art. Jeannette Genius McKean. Jeannette Genius McKean Retrieved February 4, 2008. New York Times. "Mrs. Parker Weds Francis M. Weld; Daughter of Louis Comfort Tiffany Married at Her Sister's Home in Oyster Bay, Long Island. Bridegroom, Bond Broker. He was a Captain of Artillery in World War. Bride Is Former Wife of Gurdon S. Parker." August 18, 1930. Logan, Ernest Edwin. The Church That Was Twice Born-A History of the First Presbyterian Church Of Pittsburgh, Pennsylvania 1773-1973. Pittsburgh, PA: Pickwick-Morcraft, 1973. All links retrieved July 25, 2018. History of "Louis Comfort Tiffany"
This page was last modified on 25 July 2018, at 22:40.